Eliminated having to worry if your players brought the right color jersey for the game. 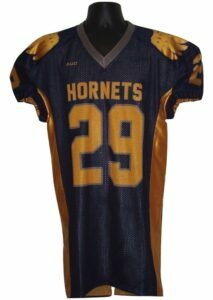 Our custom sublimated reversible football jersey are available in a standard fit, semi compression fit and full compression fit. Our custom reversible jerseys are two jerseys in one, giving you home and away color in one fully reversible garment. Made to the same specification as a single side game jerseys, you’ll be ready to take the field in style regardless of which color needs to be worn.